little availability of bestselling titles (for borrowing). difficult to find what is actually available from her library. tight limits on how many books you can borrow and how long you can borrow them for. I’ve found an additional challenge not discussed in the article. Patrons need to go through a wide variety of disparate digital portals to get at ebooks. In my local library the current number of portals for Ebooks & Downloadable Audiobooks is 14! Right now the library catalog doesn’t help much in navigating around these (although they’re trying to build a new online catalog), and if I found separate registration networks for each, then aaargh (eventually there will be one point of access, but…). This is the big worry that I mentioned at our lunch a couple of weeks ago. Libraries are being marginalized by the shift to ebooks because their existing infrastructure doesn’t enable ebook lending. They’re receiving only tepid support from publishers, none from authors, and none from Amazon. The email I showed you that I’d received from the Massachusetts librarian demonstrated his efforts to prove that publishers and authors benefit from having their books available in libraries. That’s important for publishers and authors to realize. 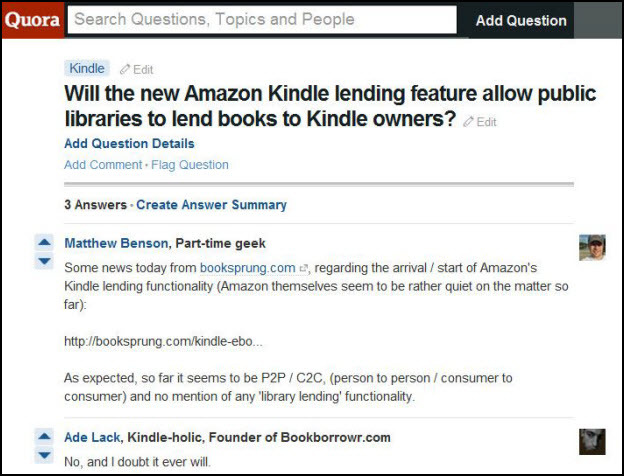 Amazon would I think be thrilled if public libraries failed in lending ebooks, not because they’re worried about theft (OverDrive, ebrary et al, protect their ebooks with more robust DRM than Amazon does). Amazon wants to sell ebooks in volume at low retail prices to the broad public, not just single copies that public libraries can lend multiple times. I believe that publishers and Amazon are content to take advantage of this ebook confusion to undermine the public library system. When you read Mike Shatzkin’s recent post about the rapidly increasing sales of ebooks (and the commensurate decline of paper book sales) you can see a fierce storm cloud forming. Meanwhile 8 of the 20 top paid Kindle books in the U.S. are .99, $1.99 or $2.99. If you look to the right of those inexpensive Kindle ebooks you’ll see another column demonstrating how many free ebooks are available. Who needs to engage in the fruitless frustration of trying to borrow ebooks from a public library when there is such a variety of free titles available, and many more for $2.99 or less? A Google search on Amazon AND “public libraries” delivered links to several books about libraries for sale on Amazon. It also delivered the pages the next images are clipped from. In the first significant revision to lending terms for ebook circulation, HarperCollins has announced that new titles licensed from library ebook vendors will be able to circulate only 26 times before the license expires. 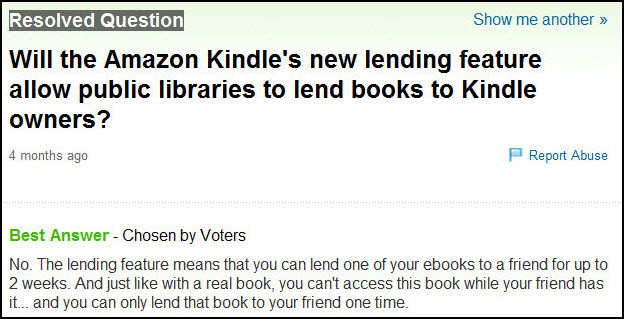 Amazon FINALLY announced Kindle Library Lending — to allow borrowing of ebooks from over 11,000 libraries in the U.S.